Chris Cope: Don't you hate it when blog posts are outdated? I do, too. That's why I'm putting this place holder post here -- to replace the post advertising an event that's already taken place. That event was thoroughly enjoyable, though. I got free pints of Guinness out of the deal, which is generally good enough reason for me to go anywhere. But also I got a chance to promote my book, which is out now. 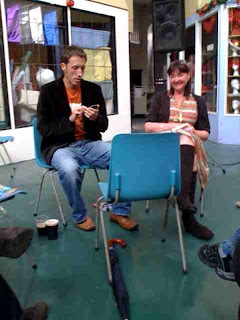 The picture on the left is of me Twittering during said event. Messages of 140 characters or less seem to be all I am capable of these days, because my parents are in town. Normal (erratic) blog service should resume sometime next week. My use of "next week" is brilliant there, because it means that this post is never outdated (assuming you don't look at the post date); there will always be a next week. Or, if we get to the point where next week will not occur, my blogging or lack thereof will likely be the least of your worries. "out now" my behind - still waiting for my "pre-ordered" copy. The wind whistles through the telegraph wires, away in the distance a coyote howls. Tumbleweed blows across the blog as a bar door flaps in the breeze. You're getting as tardy as me.